UNIVERSITY PARK, Pa. — Women’s volleyball head coach Russ Rose has signed a five-year contract extension, Sandy Barbour, Penn State Director of Athletics, announced today. Having directed the Nittany Lions to a record-setting seventh NCAA Championship in 2014, Rose has led Penn State to six national championships in the past nine seasons. Having never posted fewer than 22 wins in a season, Rose has kept the Penn State women’s volleyball program among the nation’s elite for 37 seasons. The Hall of Fame mentor is the winningest coach in NCAA Division I volleyball history with 1,189 career victories. RUSS ROSE DOES HIS BEST TO GO UNNOTICED. He sits courtside in a padded folding chair, his left foot propped on his right knee, qui¬etly jotting notes in a black plastic binder. Now and then he’ll blurt out a quick bit of instruction. He might grimace after a shanked pass or a missed block. Mostly, though, he just watches, while the fire and roar of the best women’s volleyball team in America draws all attention. 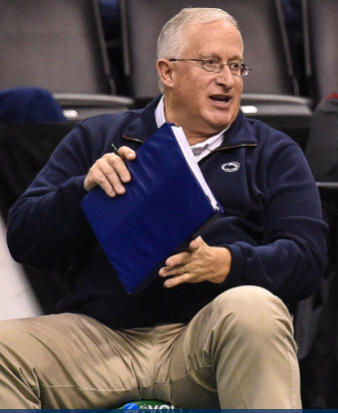 There is no curtain for a volleyball coach to hide behind, but if there were, Rose gives the impression he might have one set up at Rec Hall in time for next season’s opener. 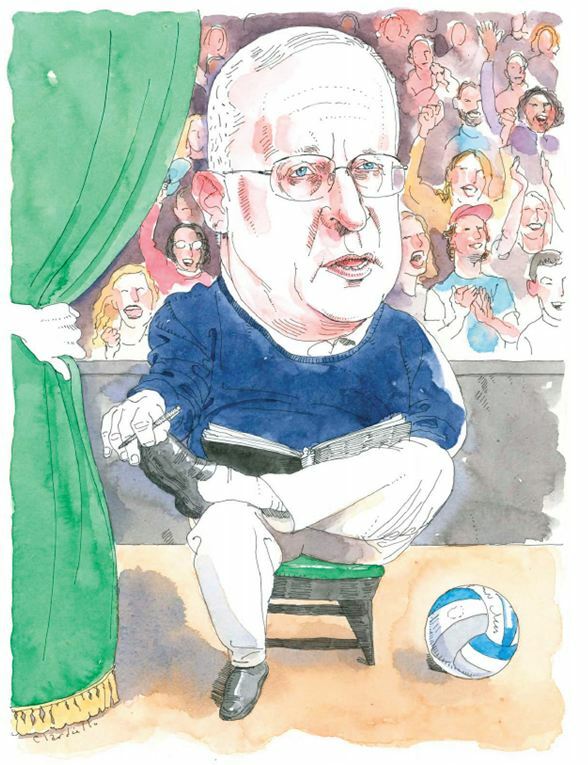 OK, so it’s an imperfect metaphor, both because Rose isn’t a con man, and because the volleyball utopia he has built in 32 seasons at Penn State is anything but an illusion. But there does seem to be something magical happening here. Just how does he coax such sustained excellence from an ever-changing cast of 18- to 22-year-olds? What’s the secret? In the wake of the Nittany Lions’ unprecedented fourth straight national championship, we went looking for answers from some of the people who know Rose best. We found a coach who’s funny, selfless, relentlessly analytical, and brutally can¬did—and a line of young women tough and talented enough to turn his coaching into yellow-brick gold. “ONE OF RUSS” REAL STRENGTHS is his style of recruiting. There’s seldom a kid who signs to come play for Russ without knowing who he is, and the kind of taskmaster he is. There are a lot of coaches who try to say things extra nicely to get recruits, and the recruits don’t really know what they’re in for when they arrive. The kids who sign at Penn State know they’re in for a challenge. He’ll allow an athlete to be an athlete. This is one of my criticisms in how we handle girls and women: We keep trying to turn them into robots. Megan Hodge ’10 Bus is a prime example. She did some stuff that volleyball purists say is just ugly. Why did Russ let her do it? Because it worked. If he had tried to make her into a robot, she never would have been as effective. TOM TAIT ’61 MS, ’69 PhD H&HD. Tait was head coach of Penn State’s first men’s and women’s varsity volleyball teams. He served on the hiring committee that brought Rose to Happy Valley in 1979. “DON’T LET HIS LAID-BACKNESS fool you. He is the hardest-working coach in the country. He would watch video. He would watch satellite games on TV at home. He scouted. He never took a break. It’s hard to be the best. He has paid his dues. He really focuses on team building. Maybe the best athlete at a certain position didn’t play a lot. He put the best personalities together to work on the court, and they found a way to win together. TERRI ZEMAITIS BOUMANS ’98 COM. Zemaitis was a three-time All-American and the 1995 Big Ten Player of the Year. In 1997, when Penn State lost in the national title match, she was the tournament’s Most Outstanding Player. but I remember the feeling—his disap­pointment. He pointed out things about leadership and work ethic. I was like, ‘OK, it’s time for me to step up.’ That next summer, the whole team stayed on campus. We were super-committed. That next season, we were a powerhouse. That’s what started this run. CHRISTA HARMOTTO ’09 EDU. A two-time first-team All-American, the 2007 Big Ten Player of the Year, and a member of the 2007 and 2008 NCAA champions, Harmotto is one of four Penn Staters playing with the U.S. national team. “I FELL IN LOVE with his coaching style the first day. I came from a program with a military regimen: sugar-free, fat-free diet, no makeup, shirts tucked in, everyone had the same hairstyle. I walked into practice that first day, and something happened, and he says, ‘Hey, Bremner. Come here.’ We go out of the gym, and he hands me this humongous Hershey bar. I’d never seen one that size. He says, ‘Just sit out there, take a breather, have a piece of chocolate.’ I remember holding the chocolate bar and thinking, ‘Is this a test? Am I supposed to not touch it? I know this is bad for me.’ But he knew exactly what I needed—to relax. BONNIE BREMNER PETTIGREW ’00 LIB. A four-time All-American and two-time Big Ten Player of the Year, Bremner was a member of the 1999 NCAA championship team. She’s married to former Nittany Lion football player Titcus Pettigrew ’00 H&HD. “WE ALL TAKE STATS during the match. His stats give him a good feel for what we’re doing well, what we’re not doing well. We’re throwing ideas at him, and he’s using his stats to either confirm what we’re saying, or say, ‘No, let’s do this.’ It’s the stuff that’s not in the box score. Like, the stat sheet could show someone has 20 digs; his would show she has 20 digs, but that she should have 30, because she missed 10 she should’ve had. DENNIS HOHENSHELT. A standout player at Juniata College, Hohenshelt spent a decade as an assistant coach with the Penn State men’s volleyball team before joining Rose’s staff in 2006. “COACH GETS TO KNOW his players better than any coach I’ve seen at this level. He has an ability to connect things to real life. After bad practices, he’d stand at the net and say, “When life isn’t going the direction you want it to go, are you going to turn it around, or are you just going to let it keep going that direction?” I coach a club team now, seventh and eighth graders, and the first thing we’re working on is approaching everything you do in life with confidence. I think I learned that from him. He never yells. I think in my career, I’ve heard him yell maybe once or twice. He doesn’t need to yell, because he has respect, and he knows it. I wasn’t an All-American, I didn’t get Big Ten Player of the Year. He allowed me to be comfortable as not necessarily the best athlete, but as a leader. Once I started to understand that, it allowed people to respect me in a leadership role. It sounds corny, but I’ve grown into a young woman under his guidance and wisdom. ALYSSA D’ERRICO. A back-row specialist and co-captain of the 2010 squad, D’Errico joined classmates Blair Brown ’10 Lib and Arielle Wilson as the only players in history to win four NCAA championships. “ON MY RECRUITING VISIT, he didn’t try to awe me with ‘Look at the big locker room, look at all this free stuff you’ll get.’ It was never like that, and that’s what recruiting is about sometimes, that whole runaround of trying to impress you. He was really the only coach who was no bull. Even if Coach says something that makes you feel like you’re the worst player in the world, every once in a while you get a compliment, and those really boost you. I’ve had some days in practice where my eyes start watering. Like, you might get kicked out of a passing drill—he doesn’t even want to look at your bad passing anymore. It happens to everyone. It can be hard at first, but you learn not to take it personally. DEJA MCCLENDON. The star of Penn State’s loaded 2010 rookie class, McClendon was named national Freshman of the Year and Most Outstanding Player of the NCAA championship. NATE MINK. Mink covered the team’s 2008 unbeaten season for The Daily Collegian, and was a student in Rose’s KINES 493 class, Principles and Ethics of Coaching. “EVERY NOW AND THEN he’ll applaud on the bench. It’s always after an amazing defensive play. That’s his thing. He’s most proud when the kids are just flying all over the court, digging passes, running transition, playing the game hard. When I played, we didn’t have the full complement of scholarships, and we were always one player away. We’d get to the NCAA regionals and lose in the final because we were competing against teams with the full 12 scholarships. It was so frustrating. Everything changed when we joined the Big Ten. It was such a blessing. We were immediately fully funded. It just really took off. LORI BARBERICH ROSE ’85 BUS. A three-time All-American from 1982–84, Barberich still holds single-season team records for kills and hitting percentage. She married Russ Rose in 1986; they are the parents of four boys. From “Russ Rose: Developing character … and characters,” by Ann Gaffigan, espnW, January 25, 2011.